Please note: As of 01/11/2013, SpotPass functionality in Nintendo Letter Box has ceased. Please see the statement about the Nintendo Letter Box SpotPass service for more information. Please note that the videos in this interview are taken from the Japanese version of Nintendo Letter Box. The application is fully localised for the UK. 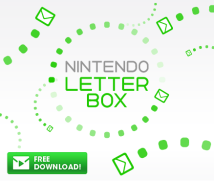 Today, I would like to ask about the Nintendo Letter Box application, which is available from Nintendo eShop. First, I would like each of you to introduce yourself, including what you were in charge of. 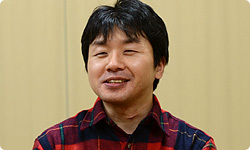 I’m Takenouchi from Denyu-sha.1 I pulled together the programming for Nintendo Letter Box and also worked on programming for the SpotPass2 feature. 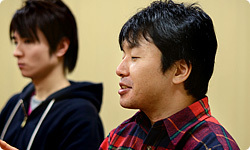 1Denyu-sha Co., Ltd.: A game developer in Kyoto. Denyu-sha developed software for the portable game system Pokémon Mini, collaborated in development of Nintendo Zone and Demae Channel (available in Japan), and in addition to Nintendo Letter Box, it has developed the Games Notes function for the Nintendo 3DS system. Established in 2002. 2SpotPass: A feature in the Nintendo 3DS system that, when activated, receives various information and content when near a wireless LAN access point. 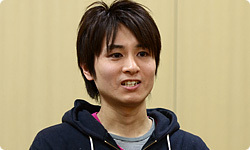 I’m Kondo from Denyu-sha. I was in charge of lead design, mainly related to UI (user interface). I’m Imai from Nintendo’s Network Business Department. I was director. I’m Kitai, also from the Network Business Department. I was in charge of designing the stationery. I participated towards the end of development. Kitai-san, how long has it been since you moved to the Network Business Department? Part of this project changed a little toward the end when Kitai-san joined, right? I’ll ask about that later. Imai-san, would you tell me about the path this software took? Sure. It originally started soon after the Nintendo DSi3 system went on sale (in Japan) in November 2008. We were talking about how there wasn’t much downloadable software for it. 3Nintendo DSi: Released November 2008 in Japan, April 2009 in Europe. A handheld game system in the Nintendo DS series incorporating numerous features such as Nintendo DSi Camera and Nintendo DSi Sound. Users can connect their system to the Nintendo DSi Shop over the Internet to purchase downloadable software. Yes. (laughs) We were talking about whether there was anything we could do within the department, and the idea for a picture diary came up. It would be perfect for downloadable software, so I raised my hand and said I’d do it. And that’s how this project began. Before the idea of a picture diary came up, I had thought it would be neat to be able to record a child’s development, like in a maternity health record book, and then give it to them when they grew up. 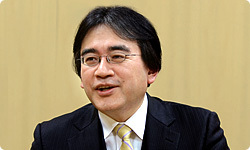 And Iwata-san, you were always talking about “my DS” back then. If something is invested with your own feelings or your sentiments toward those who are important to you, that thing becomes an important treasure—it becomes “my” thing. Then, when we had the idea for a picture diary, I remembered that my older sister had been keeping a diary for ten years, ever since the birth of her baby. What she had been doing was exactly what I had wanted to do, but with a maternity health record book. With a stylus with a picture diary, you could do exactly that. In this day and age, with the spread of personal computers and cell phones, typing is a matter of course, so why did you decide on a handwritten picture diary? I think anyone would agree that with typewritten e-mail you can’t fully get your feelings across. There are pictograms and emoticons, but with text, it’s still often difficult to express your feelings. People often say it’s easy to get into a quarrel via e-mail. Exactly. A long time ago, one of my friends couldn’t get their feelings across in a mobile phone text and ended up getting into a fight, and eventually just tossed it in a lake! (laughs) That friend did go and get it later, though. That’s how difficult it is to convey your feelings through text alone. But with handwriting, the writer’s personality comes out and there’s warmth to it. While we’re focusing on handwriting, right at the beginning of development of the Nintendo DSi system, we were imagining something simple you would use just to keep your own picture diary. Not an exchange diary you would pass back and forth with someone else. Right. We intended to finish in three months. And the three months became three years. Yes. (laughs) When we began development, we talked about doing a picture diary ourselves to find out what one was like. Yes. A real picture diary that you write on paper. 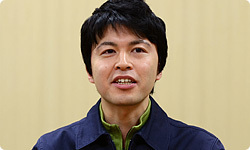 But of the development staff members, Kondo-san from Denyu-sha was the only one keeping a diary every day. So we started keeping picture diaries, and after about a month, when I asked everyone about it, the only ones continuing were Takenouchi-san and I. So we thought, “Is this project alright?” Why people quit became a big theme for us. You wondered how you could get people to keep it up. But as we mentioned earlier, once I started actually keeping a diary, I was surprised to find I could keep going. Was that because you found keeping a diary could be fun? Yes. Writing a diary, I made all kinds of discoveries. For example, a small thing was how thoroughly dependent I was on a computer or cell phone’s kanji conversion function. I noticed that I couldn’t write kanji characters anymore! And there are some things you can’t type—like adding in a little illustration or adding emphasis through large letters—that you can easily do handwritten. You clearly leave behind your memories, so I definitely thought it was fun. And that’s why you were able to continue? Kondo-san, you had been keeping a diary for a long time, right? What is fun about keeping a diary? I like how what you write rapidly builds up. And when I read back over what I’ve written, I make discoveries, like, “Oh, so that’s what I was thinking back then.” So I knew what was fun about a diary, but I wondered a lot about how I could convey that to others, and what I could do to encourage them to keep a diary, too. Only two members of the development team had been able to keep writing, so I thought we needed something extra for our picture diary that would keep people going.